IntCon is a vector of positive integers that contains the x components that are integer-valued. For example, if you want to restrict x(2) and x(10) to be integers, set IntCon to [2,10]. Restrictions exist on the types of problems that ga can solve with integer variables. In particular, ga does not accept any equality constraints when there are integer variables. For details, see Characteristics of the Integer ga Solver. ga solves integer problems best when you provide lower and upper bounds for every x component. This example shows how to find the minimum of Rastrigin's function restricted so the first component of x is an integer. The components of x are further restricted to be in the region 5π≤x(1)≤20π,-20π≤x(2)≤-4π . and constraint violation is less than options.ConstraintTolerance. ga converges quickly to the solution. No linear equality constraints. You must have Aeq =  and beq = . For a possible workaround, see No Equality Constraints. No nonlinear equality constraints. Any nonlinear constraint function must return  for the nonlinear equality constraint. For a possible workaround, see Example: Integer Programming with a Nonlinear Equality Constraint. No custom creation function (CreationFcn option), crossover function (CrossoverFcn option), mutation function (MutationFcn option), or initial scores (InitialScoreMatrix option). If you supply any of these, ga overrides their settings. ga uses only the binary tournament selection function (SelectionFcn option), and overrides any other setting. No hybrid function. ga overrides any setting of the HybridFcn option. ga ignores the ParetoFraction, DistanceMeasureFcn, InitialPenalty, and PenaltyFactor options. There are no hybrid functions that support integer constraints. So ga does not use hybrid functions when there are integer constraints. To obtain integer variables, ga uses special creation, crossover, and mutation functions. 3x1 – 2x2 ≥ 5. –3x1 + 2x2 ≤ –5. You can try to include the equality constraint using A = [3,-2;-3,2] and b = [5;-5]. Be aware that this procedure can fail; ga has difficulty with simultaneous integer and equality constraints. x(1), x(3), and x(5) are integers. The Ackley function, described briefly in Resuming ga From the Final Population, is difficult to minimize. Adding integer and equality constraints increases the difficulty. To include the nonlinear equality constraint, give a small tolerance tol that allows the norm of x to be within tol of 4. Without a tolerance, the nonlinear equality constraint is never satisfied, and the solver does not realize when it has a feasible solution. -(norm(x) - 4) ≤ 0. -(norm(x) - 4) - tol ≤ 0. 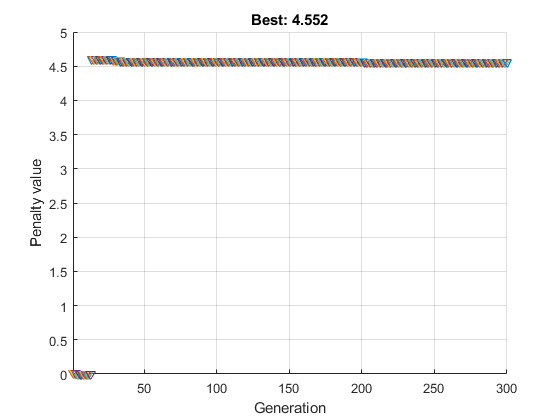 MaxStallGenerations = 50 — Allow the solver to try for a while. FunctionTolerance = 1e-10 — Specify a stricter stopping criterion than usual. MaxGenerations = 300 — Allow more generations than default. PlotFcn = @gaplotbestfun — Observe the optimization. The odd x components are integers, as specified. The norm of x is 4, to within the given relative tolerance of 1e-3. The second run gives a better solution (lower fitness function value). Again, the odd x components are integers, and the norm of x2 is 4, to within the given relative tolerance of 1e-3. To use ga most effectively on integer problems, follow these guidelines. Bound each component as tightly as you can. This practice gives ga the smallest search space, enabling ga to search most effectively. If you cannot bound a component, then specify an appropriate initial range. By default, ga creates an initial population with range [-1e4,1e4] for each component. A smaller or larger initial range can give better results when the default value is inappropriate. To change the initial range, use the InitialPopulationRange option. ga can take a long time to converge. If you reach the maximum number of generations (exit flag 0), increase the value of the MaxGenerations option. Decrease the mutation rate. To do so, increase the value of the CrossoverFraction option from its default of 0.8 to 0.9 or higher. Increase the value of the EliteCount option from its default of 0.05*PopulationSize to 0.1*PopulationSize or higher. For information on options, see the ga options input argument. Special creation, crossover, and mutation functions enforce variables to be integers. For details, see Deep et al. . If the member is feasible, the penalty function is the fitness function. 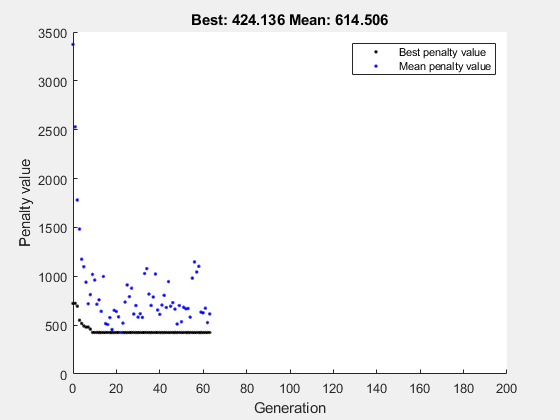 If the member is infeasible, the penalty function is the maximum fitness function among feasible members of the population, plus a sum of the constraint violations of the (infeasible) point. For details of the penalty function, see Deb . ga does not enforce linear constraints when there are integer constraints. Instead, ga incorporates linear constraint violations into the penalty function. Deb, Kalyanmoy. 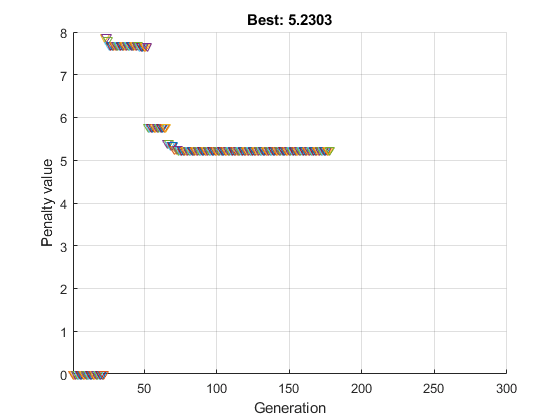 An efficient constraint handling method for genetic algorithms. Computer Methods in Applied Mechanics and Engineering, 186(2–4), pp. 311–338, 2000. Deep, Kusum, Krishna Pratap Singh, M.L. Kansal, and C. Mohan. A real coded genetic algorithm for solving integer and mixed integer optimization problems. Applied Mathematics and Computation, 212(2), pp. 505–518, 2009.